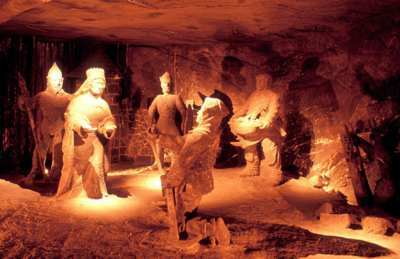 The Royal salt mine "Wieliczka" is like a vast underground city. It is the oldest working mine which is open for tourists in Europe. Salt was mined here as long as 700 years ago and today the mine consists of nine levels going down to a depth of 327m. There are 2,040 chambers connected by 200km of passages. The mine contains, beneath the mine itself, numerous churches, chapels, and rooms for leisure activities. Near the entrance is the chapel of Saint Antonius located. The whole room was covered with sculptures made of salt. But as the chapel is close to the entrance, the moist of the air destroyed the figures. Today they look like modern art, or maybe prehistoric sculptures.